[retrieved May 1, 2015]. Original source: heqigallery.com. Look at the whole list of stories.. The RCL did not include every story and split some into two weeks. I’d omit one or two they list and think they missed some great stories. (The ones in bold italics are those I added.) Choose the ones for your series. 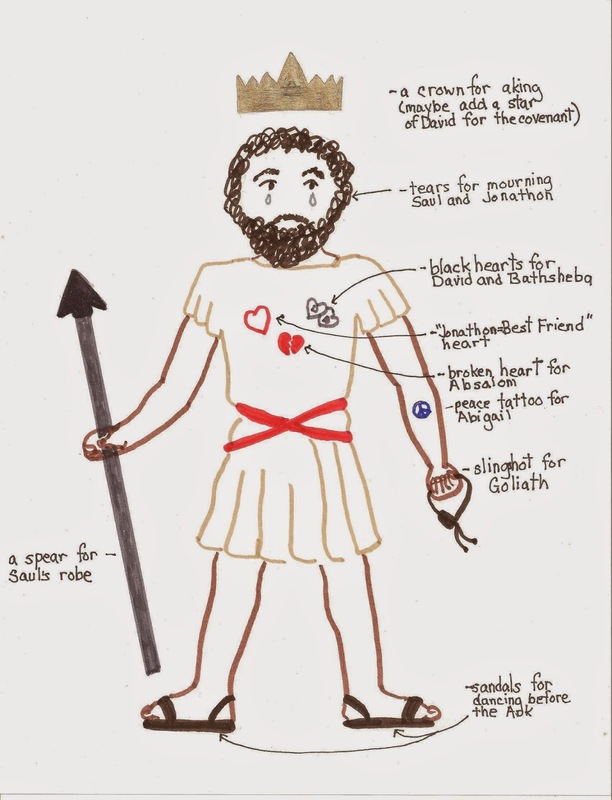 There are several stories about David, Jonathan and Saul’s relationships that could be combined in different ways. 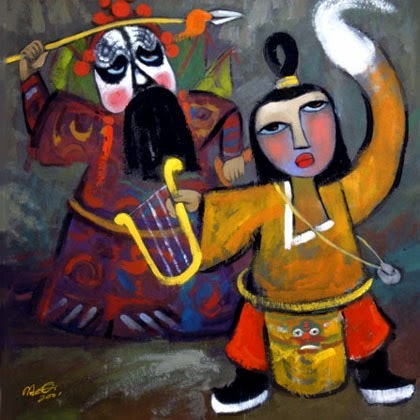 “Nabal the Fool” in The Children’s Bible in 365 Stories, by Mary Batchelor, offers a shorter, easier to follow version of the story. Don’t just read these scripture texts. Use your best storytelling arts to present the stories for the congregation to savor. In the weekly posts you will find reading scripts, pantomime directions, and other presentation suggestions. Invite worshipers of all ages to work with you in presenting these stories. This book comes in several different covers. Some of the stories presented in the Bible are the result of numerous editors and thus are long, repetitive in spots, and simply hard to follow. Turn to children’s Bible story books for more straight forward tellings. 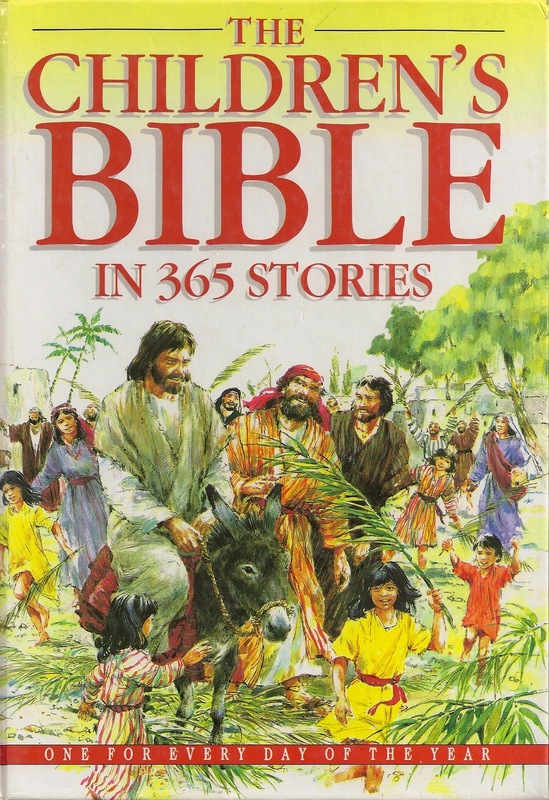 The Children’s Bible in 365 Stories, by Mary Batchelor, which includes 30 stories about David many of which are among the lectionary readings, is an especially good source. Each week add to a David figure an item that recalls the day's story. The figure could be a freestanding figure cut from foam core or a figure glued or painted to a fabric banner. When Samuel anoints him to be King the crown is placed above his head, then is lowered to sit on his head if you read story of David being crowned. Look at the David the folks at First Presbyterian Church Hightstown New Jersey created. WOW! Thank you for sharing this infomative slide Lisa Day. The rest of us would love to see what other did at their churches. 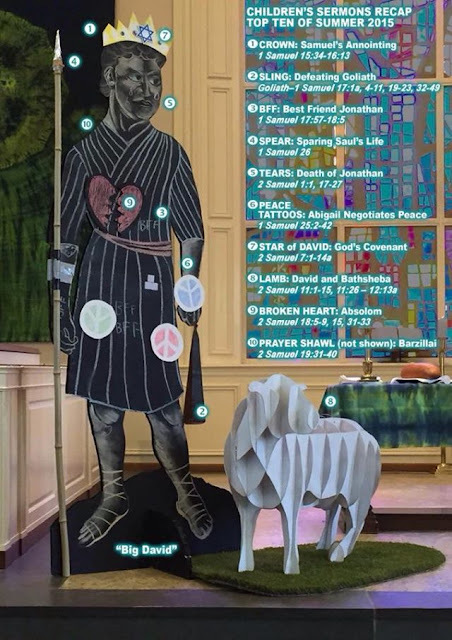 David expressed his faith in dozens of psalms that he wrote and sang. Some are generic, but many relate to specific events. Take time to connect those psalms to the stories that go with them. Pretend to be David praying them in each situation. Identify situations in which we need to pray them today. Look for me to add more psalm suggestions to those already in place for each Sunday. Encourage worshipers of all ages to learn Psalm 23, David’s most well know psalm, by heart this summer. Provide a Psalm 23 bookmark or other such award for reciting it to you. Rather than asking only children and youth to do this, challenge the whole congregation. Celebrate older members who can do it on the first Sunday of the series AND anyone who joins them as the weeks go on.